January 31, 2019, 4:32 PM · Welcome to "For the Record," Violinist.com's weekly roundup of new releases of recordings by violinists, violists, cellists and other classical musicians. We hope it helps you keep track of your favorite artists, as well as find some new ones to add to your listening! Philippe Graffin’s virtuosity combined with his skills as a sleuth have led to the world-premiere recording of a "Posthumous" solo violin sonata by Eugène Ysaÿe, an astonishing discovery that extends the Belgian composer’s canon of his essential six sonatas for the medium. Here is the manuscript of the sonata.) Philippe unearthed the nearly-completed manuscript in the library of the Brussels Conservatoire, and polished off the final movement in the most Ysaÿe-esque manner possible. Fiddler’s Blues also includes another Ysaÿe premiere, the "Petite fantasie romantique," as well as two works by George Enescu, another virtuoso violinist/composer who emigrated from his native Romania and, like Ysaÿe, settled in Paris. Enescu was a classmate of Maurice Ravel, whose "Berceuse sur le nom de Gabriel Faure" is an affectionate nod to their teacher at the Paris Conservatoire. The album also includes Ravel's Violin Sonata (its "Blues" movement reflected in the name of the album). Claude Debussy wrote no works for solo violin, so Philippe contributes his own arrangement for solo violin, made together with David Matthews, of Debussy’s piano piece "Claire de lune." BELOW: Enescu's Sonate No. 3, Op.25: Allegro con brio ma non troppo mosso. Violinist Eldbjørg Hemsing met composer Tan Dun at the 2010 World Expo Shanghai, where both artists were representing their countries. Eldbjørg, then 20, brought her Hardanger fiddle from Norway and Tan Dun arrived with a collection of Chinese instruments. The two artists became friends and have collaborated on many projects, including the Chinese premiere of Tan Dun’s "Love concerto" and a performance for his appointment as UNESCO Goodwill Ambassador. Most recently, Hemsing became the first Western violinist ever to perform with the China National Traditional Orchestra. In their work together they have found a natural, common identity through traditional music – both from China and Norway – and through bringing the traditions into the forefront of contemporary music. Hemsing writes, "There are several similarities between Chinese traditional music and Norwegian folk music, in everything from certain rhythms and harmonies to the very nature of how it lives. In Norway, for example, folk music is not written down. Everything is in your ear. This is the same in China, where the music is passed down from one generation to the next. It lives through how people play. That is something core to both the way Tan Dun and I approach music, enabling us to push the boundaries of contemporary music. It connects and unites us between two seemingly very different cultures." The concerto "Fire Ritual" was composed with Hemsing in mind. With it, Tan Dun has created a musical ceremony for the victims of war, building on four themes: Cruel Wars, Innocent People, Mantras of the Heavenly Birds, and Eternity. The concerto was premiered in September 2018 by Hemsing and the Oslo Philharmonic, conducted by the composer. Tan Dun composed the concerto that opens the disc, Rhapsody and Fantasia, for Hemsing as well. Both works reflect the composer’s memories of growing up barefoot in the countryside, and his later experiences of bringing together the shamanistic and spiritual world of his childhood with the discipline and philosophy of Peking Opera. In the composer’s own words, the work represents "a reflection of those early memories of my youth, but through the lens of my current musical soundscape." BELOW: The artists talk about "Fire Ritual," with excerpts from the work. From the quartet: "In this recording we bring you music born of Hungarian and Taiwanese soil — much in the spirit of Béla Bartók, the ethnomusicological father of us all, and in tribute to our own namesake, the island of Formosa. We present the two folk traditions in two parallels: Taiwanese folk music in both a more raw "folk" form (Wei-Chieh Lin's Five Taiwanese Folk Songs) and a more stylized treatment (Lei Liang's Song Recollections); alongside Hungarian folk music in both a more raw "folk" form (Dana Wilson's Hungarian Folk Songs) and a more stylized treatment (Béla Bartók's Fourth String Quartet). Containing three commissions dedicated to Formosa Quartet, the music is from start to finish a compelling journey from which each listener will no doubt identify personal highlights." BELOW: The Formosa Quartet performs Bartok String Quartet No. 4: II. Prestissimo, con sordino. 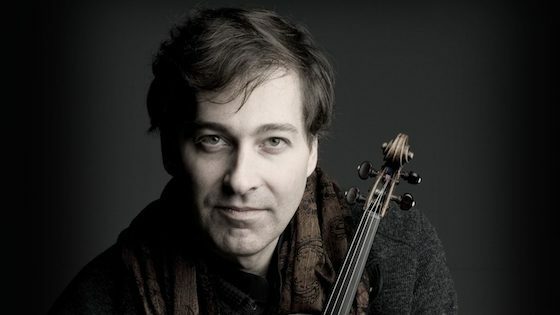 In this new recording of Bach's Suites 1, 2 and 3 for solo cello, Israeli-American cellist Amit Peled performs on the 1733 Goffriller cello formerly owned by Pablo Casals, the same instrument Casals played in his groundbreaking 1936 recording of the Suites. "Casals had nothing in his ear as a model when he began recording the Suites," Peled said. "When I started, I had his recording, of course, plus those of 50 other great cellists. I’ve had the honor of performing on this cello since 2014 and I needed time with the instrument in order to find my own voice, my own interpretation, so I could approach this repertoire with the same freshness that he did in 1936." Before Casals began performing Bach’s Suites in public concerts, they were regarded almost exclusively as pedagogical pieces. Bach unaccompanied music was not deemed concert material until Casals changed that almost single-handedly. BELOW: Amit Peled describes what it was like to play the Bach Suites on the same cello that Pablo Casals recorded them on. February 1, 2019 at 05:16 PM · I adore Graffin (and Desert), so excited about this album (which I just ordered)!